This meat-free, vegan / vegetarian ground "turkey" is a great substitute for any recipe calling for loose ground meat. Turkey Not! Ground is a great for pizza, casseroles, tacos, chili, and more! Just add hot water or broth, let stand for 5 minutes, then add to your favorite recipes. "How do you cook Dixie Diners' Turkey (Not!) Ground?" Follow these tips for great results! 4) Enhance the flavor by adding one of our other great vegetarian / vegan seasoning products while hydrating or cooking. 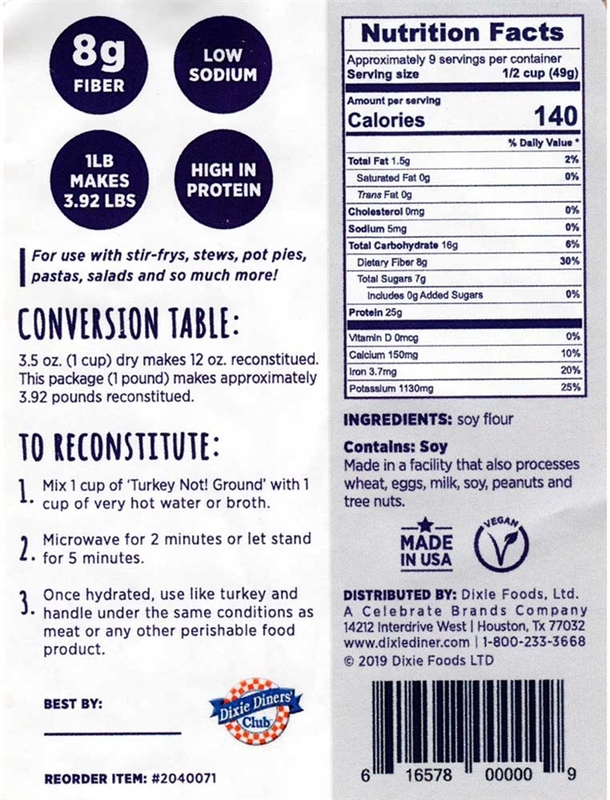 This 1 pound bag makes approximately 3.92 lbs or 9 servings of vegan / vegetarian ground "turkey."